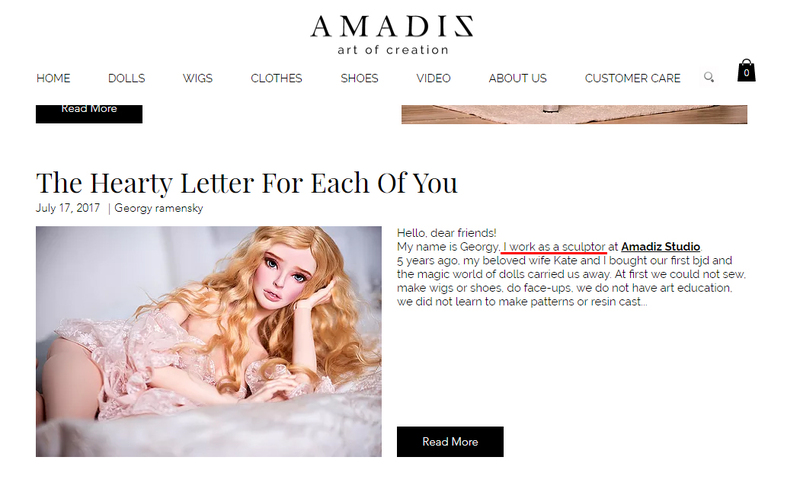 Amadiz Beauty is a highly controversial doll company, and its owners Georg and Kate Ramensky are unscrupulous businesspeople with a tendency to publicly attack people who provide any kind of criticism of their work. Please note the thread on Holywarsoo.net dedicated to Amadiz Beauty and especially the headpost. The headpost contains links which in great detail expose Amadiz Beauty's lies, attempts at concealment of such lies, blackmail, stalking and overall unethical activity in Russian BJD community. The information comes from clients and customers of the company who suffered either a faulty item or psychological pressure exerted by Amadiz representatives Georg and Kate Ramensky, some information is provided by a former tailor of Amadiz Beauty. The most striking examples of Amadiz Beauty's unethical idea of doing business and providing prizes are summarized below. 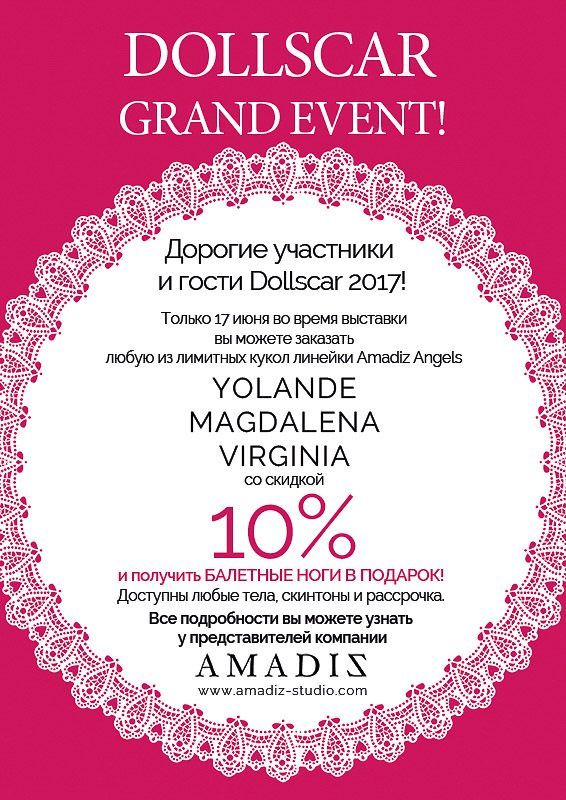 Amadiz Beauty has a history of providing failed goods as prizes for doll events. They market themselves as a luxury segment studio and yet the prizes they provide are far from being any kind of luxury items. One notable and recent situation involves the prize wig for the winner of Historical Myth 2017 Moscow event. The photos here show an elaborate wig with beading and flowers, with a complex hairstyle. When the winner received the actual wig, the paper flowers fell off and some of them fell apart. The top part near the parting had a piece of weft just cut and glued in place, the glue was visible from many angles. The left part of the wig had glue spots (previously covered by fallen off roses) and the glue damaged plastic faux-pearl beads. Discoloration and deformations are clearly visible in the photo. Also some locks were showing discoloration due to hair styling products. The winner posts a review of this prize wig in her personal blog. Another Historical Myth event winner of a similar Amadiz Beauty wig also adds the photo of the prize they received, with wig cap being clearly visible between hair wefts. Commenters ask whether or not the winner is going to contact Amadiz Beauty for repairs, which brought up an earlier story - where the same winner also received an Amadiz Beauty wig as a prize and did contact them when it was too small to fit her doll. It ended up with the wig cap being cut and an elastic fabric being sewed in, instead of thorough repairs. Georg Ramensky of Amadiz Beauty rushes to comment with the offer of help and repairs for their clients as stated in the warranty section of certificate of authenticity. The winner replies that she presumed she was not eligible for their customer service due to her winning the wig as opposed to buying the wig. Georg Ramensky states that the service Amadiz Beauty provides is equal for all the Amadiz wig holders and they're happy to make their clients happy. They also agree to pay the postal fee of sending the wig in question for revisions. So far so good? Yeah. But not quite. The situation with the prize wigs is being widely discussed on the anonimous BJD community BJDLeaksBranch where Georg Ramensky of Amadiz Beauty is a moderator. Anons state that this level of quality for a wig submitted as a prize for one of the most important Russian BJD events, is unacceptable no matter how good a customer service the Studio provides. Offended wig maker Kate Ramensky of Amadiz Beauty makes her statement.
" I am saying this as a person, not as a firm representative. I am an educated hairdresser  and started my doll wig making career in 2012. Since then I have made many wigs with creative technologies and tried my best to make them as realistic as possible. Now I am teaching other wig makers of our studio. If a wig has obvious faults then it's wrong and needs to be fixed or remade. But every mistake is the responsibility of the one who made it. But all mistakes save fatal ones can be fixed. Therefore I can never understand people who are unsatisfied with something but wait and keep silence, or those who talk behind the master's back about being unsatisfied. Every adequate master is always ready to fix their mistakes. I am making 4 wigs a day regularly and 5-6 a day before any events. For Historical Myth event we decided to provide 3 complete wigs and 3 certificates, totaling 750 usd. But I am making these wigs for free out of respect for the event organisers and guests who worked very hard. Georg and me are always happy to see others' meticulous work and we wanted to thank them by making these wigs. Maybe we should've given prize certificates but we wanted to make more material prizes for people. I will answer several queries that have been brought up here. Why did we use the plastic beads? Because we didn't have any others. It was not a commission wig, but an experiment. If a client wants Svarovski beads they will receive Svarovski beads whether the client is Russian or foreign. Why the flowers fell apart? I dunno. They were fine. They're easily removed as it is a feature of Amadiz Beauty wigs. Do our wigs always have defects? No way. If there are faults, we always pay for shipping the wig back to us for fixing. But Russian clients contact us for client service five times less often than foreign ones, preferring anonimous bullying instead. We do not hate Russian clients and never call them names. This is lies. We work to make every commission a success. " TL;DR - Amadiz Beauty representatives Kate and Georg Ramensky state that they made the wig, faulty as it was, but those unsatisfied with the quality of the prize are stinking liars. Also, Amadiz reps have a tendency to make blogposts where they heavily allude to their clients and make unsavoury comments about them, all the while pretending to be speaking "in general". They remain true to themselves in this situation as well, on one hand saying that the client shoud contact them directly, while on the other hinting that posting your personal thoughts about their product in your personal blogspace somehow makes you a hypocrite and a dishonourable person overall. The Historical Myth 2017 winner decides she doesn't like this level of customer service with masked insults from Amadiz Beauty and forfeits the prize altogether. Amadiz Beauty refunds her to save face, but boasts about selling the prize wig to someone else, someone foreign, as it was for its full price of 149 usd. Amadiz reps claim that the foreign client was elated to buy this wig, unlike the ungrateful Russian rabble. However, according to True BJD Confessions Tumblr, not all foreign clients of Amadiz Beauty are satisfied. There's also a review from DOA user in the same vein. This discussion also brought up a situation where the client explicitly forbids the publication of the photos of costume she commissioned from Amadiz Beauty, wanting to show it on her own doll first, only to see the photos posted on their blog the moment costume was completed. Amadiz Beauty will not let you show the stuff you commissioned from them first. They will always beat you to the punch, so don't hope to wow your friends with something made by Amadiz. The second instance of the quality and customer service level also involves a prize, this time a Yolande doll by Amadiz Beauty submitted as a prize for Dollscar 2017. The Yolande doll was to be showcased for the first time ever at Dollscar as well, along with the new male body and revised female body. The winner received the prize and left a very thorough review on Russian BJD forum, stating that they liked the doll but it didn't fit their collection and would be found a new home. The photos of the prize here clearly show that resin the doll was made of has dirty particles (in the chest and thigh areas), weird lumps and scratches (forearms, ears, nape), either non-existent or very rough sanding (hands, toes). This level of quality for the prize that Amadiz Beauty themselves market as luxury item without a fault sparked another heated discussion on the anon community BJDLeaksBranch. Following that Georg Ramensky is kicked out of the BJDLeaksBranch moderating team for attempted blackmail and extortion, threats to the anon community, threats of suing, and for using his moderator position for collecting anons' personal information for persecuting and stalking them. But following that Amadiz Beauty revises the body further and many changes are made, which in turn lead into the Magdalena controversy (more on that later). Then, Yolande doll finds a new owner who posts a review of her own. Once again we can see the same lumps and scratches and horribly sanded fingers and toes. While enjoying the doll overall and its resin particularly, the new owner shows the foot joint that limits the doll's posability. She laments that she will need to change the feet of the Yolande doll for something else because the doll cannot stand by itself on those, either barefoot or wearing shoes. The owner considers contacting Amadiz Beauty after Kate and Georg's vacation ends about changing the feet and hands for the new, revised versions. Unsuprisingly, Georg Ramensky of Amadiz Beauty rushes to comment in his charming passive-aggressive style. "I am very happy to see the doll made by me in my friend list. It pleases me to see you note the quality of resin, the beauty of the doll and detail work, posability and joints, as it is important for me in my own dolls. This doll you own was a one-off and was never part of any batch due to technical and aesthetic imperfections you mention. I never liked them and revised them as soon as I learned how to do it better. I started revisions even before the Dollscar event. And a month later Yolande mold was being sold on a revised body, with revised joints, new hands, feet, calves, and you had the opportunity to purchase the doll whose look you liked during the sales period. Now, you obtained this doll second-hand from the Dollscar event winner, and I am sure you knew what you were buying from the winner's photos. Neither the winner nor we concealed any details, which do not even deserve to be discussed since no one else in the world has a doll like this except you. Your doll is unique. About faulty sanding on the head and foot. I admit that doll making is quite a new line of business for us, and we strive to learn as fast as possible to provide our clients with the best service possible. We learn fast, after 3 months from the creation of your one-off doll we already provide sanding of a much better quality for customers who order it. Since I'm writing here as a person on vacation, I will write my honest thoughts here. I'm the author of this doll and I sincerely love my dolls. I want them to have all the best, and to admire them either at home or on owners' photos. Of course, I am also saddened by the imperfections of your doll which was a testing sample. And, stating this, I would have gladly offered you to change all eight parts (two pairs of hands, two pairs of feet and two calves with the new joint) absolutely free of charge because I want both me and you to enjoy the doll completely. I would have gifted you even the ballet feet simply because I could spare them and they become the doll very much. I would have sent you the original box, and the new revised certificate [of authenticity], and the pretty glossy guidebook instead of the rushed works made for Dollscar when we didn't have the time. I would have given it to you just so you could have it. But you should have acted like an honourable person for that. And before writing about us as a "controversial firm" while we never sold you anything, you should have written me directly, via PM, something like "I bought old Yolande second-hand but I like the new hands and feet, could you help me?" and I told you what I would have replied you with. From the firm's point of view, you should've written to our official e-mail. From the firm's point of view you purchased the old trial version of the doll, as a one-off, with the defects and imperfections that you have known about, and now you want to change the old parts for the new ones, which you never purchased. I can't recall any doll company that exchanged the doll bodies bought second-hand for their new revised ones. Correct me if I'm wrong. Therefore, the exchange cannot be made for free. The cost of materials and our workers' time must be paid for, since the doll was provided to a completely different person as a prize for the win, and our firm cannot and must not bear responsibilty for the second-hand buyers. The warranty only covers the broken parts, and your doll doesn't have any. The doll can stand by itself, as you can see in the review of the previous owner. The doll's inability to stand in the shoes not intended for her and without the doll stand is also not an issue of it being broken. The price for the parts you want will be provided to you by our manager, when their vacation ends, but you can look up the price of the hands and feet on our official site. The decision is yours to make, and you can contact either me personally or the company mail." TL;DR - Amadiz Beauty would exchange the doll parts for free but only if you prostrate yourself enough before them. Oh, and failing to do so makes you a dishonourable person. Also, the prize submitted for the most important Russian BJD event is a "trial version" and Georg Ramensky learns how to sculpt by selling his first attempts at the high price of a finished and polished product. The owner replies, reminding Georg about warranty terms he stated in the Historical Myth prize wig situation.
" I do think this doll is not bad, all her faults can be attributed to her being a trial product of your company, even as a prize. I wanted to hybrid her body but I am considering leaving her as is now. But seeing the photos I could never imagine that it would have such an ill-conceived design of its feet and hands. It wasn't shown. Maybe I should've looked harder, but I'm used to buying dolls from official companies and seeing that the doll has all the fingers and toes and can stand on its own. I tried many dolls, and even though making the 5th Motif Venitu stand was a total pain, it was still incomparable with this Yolande's inability to stand. And if we're really talking here like two private individuals, I state that I couldn't care less about this particular uniqueness. You declared that you're ready to make changes in accordance with the owner's/the prize winner's wishes, when the Historical Myth prize wig was discussed. If I recall correctly, you stated that warranty covers both direct buyers and second-hand buyers for 14 days period. You say that it's the course of action of any luxury firm. We have discussed this topic previously and I remember being slightly disappointed and giving up on the idea of commissioning a wig from you. But you seemed to have fulfilled your responsibilites. 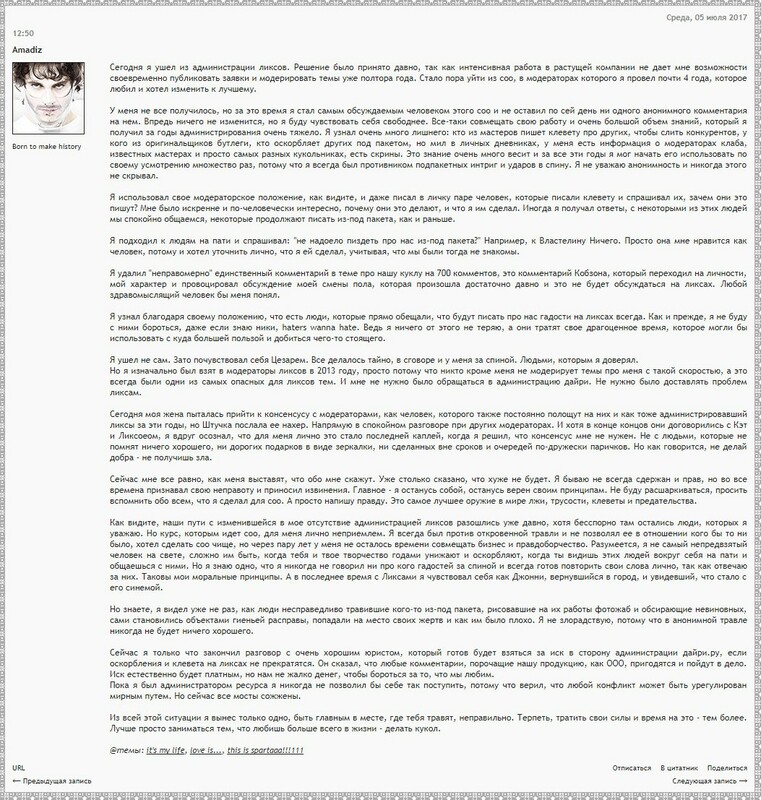 I wrote this review in my personal blogspace and never posted it on DOA or BJDClub. You, on the other hand, are on vacation (I think?) and I wanted to have the doll arrival date fixed to not lose my warranty eligibility. Also, many of my acquaintances wanted me to make an honest review, and my blogspace is enough for this purpose - for now. - Is free warranty available only for those clients who never review the doll's imperfections and failings? If I am eligible for warranty, then I will contact your firm after your vacation period to have hands and feet recast, this time smooth and without lumps. It will make them easier to customize. Also, I'd like to submit this review to your Review Contest. TL;DR - The owner recalls Amadiz Beauty providing 14 days free warranty period and wants to have faulty and crudely made parts exchanged for fault-free and smooth ones. And to be a part of the Amadiz Beauty Review Contest. Kate Ramensky's answer to the owner's queries throws shadow on the eligibility for the Amadiz Beauty Review Contest.
" You can see the same foot joint in Iplehouse dolls. Even if you haven't encountered those, you could clearly see it in the Dollscar winner's unpacking photos. This joint indeed limits the movement of the foot. That's why we discarded this joint which couldn't replace the original ball joint of this line of dolls. But the doll can stand perfectly either on these flat feet or the heeled feet, which you can again see in the unpacking or the promo photos on our site. We don't acknowledge as a defect the issue of doll not standing in shoes of other companies not intended for our doll. If you have our company's shoes, you can see that the doll can even stand in heels. You cannot demand us to bear responsibility for other companies' shoes and their balance, it's absurd. You didn't buy our company's doll looking at the promo photo. You bought it second-hand and if you couldn't see some defects or failings of the doll it means that the information the seller provided was insufficient, or they didn't consider that a defect. Anyways, warranty only extends to broken parts or failings which were discovered in 14 days period of receiving the product. If the winner sold the doll the next day or even a week later, it wouldn't be a problem. But what is your claim to the warranty when the original owner received the doll more than two months ago and never reported any issues? Please understand that no manufacturer, even in the luxury market, will bear the responsibility for a used product and bought second-hand. Georg wrote the Historical Myth winner, to whose situation you appeal now, that if you behave honourably, we will help any owner of our item and we will never refuse to help them, to exchange or to remake the item. And this is what we're talking about, if you personally ask us for any help, we won't refuse you. We'll try to help and solve your problem. But you do not ask us, you appeal to some absurd responsibilites that our company must bear for you personally when you never was and never will be our client. Your logic is absurd, because according to it, if Person A owned a doll for 3 months and then sold it to Person B with some spot on doll's head, and Person B wouldn't notice the spot on the photos they will blame the doll company. The company has no idea how Person A treated their doll and what the origin of this spot was. The company cannot know whether it was a casting mistake or the owner's treatment result. But our offer cannot be considered a warranty service, because our warranty only covers the lodging of a claim during the 14 days period starting from receiving the doll or item and excluding the shipping time. Any item can have many owners and as long as it still fits the warranty period, the warranty remains the same. Also, if any doll part breaks, we offer our customer a free and immediate exchange. But your issue is not of a broken part, and you personally are not our customer (or winner). The old casting molds of Yolande were scrapped since its release because our company didn't produce the doll you own for sale and never intended to. Therefore you cannot exchange the hands and feet for like parts. We do offer you the initial solution while not accepting it as a warranty case, no matter how offended that could make you. The head, torso and hips sanding, that you suddenly mentioned (and I understand why), can only be done if you send us the whole doll back for checking and casting of the new parts which would have to be colour checked for your particular doll. You cannot take part in our Review Contest, unfortunately, since only the clients who bought the dolls directly from our company can take part in it, it's not a contest for owners of second-hand prize doll, never publicly released." TL;DR - Amadiz Beauty provides free warranty of their dolls. Except it doesn't. And if you got your doll second-hand, boohoo, you're totally out of luck, because Kate and Georg Ramensky will blame previous owners to ditch their responsibilites. Funny how their Contest ad says "all who possess dolls of our company", no mention of second-hand owners exclusion. The owner thanks Kate for her answer and says that since the original winner got the doll and made photos of her, she (current owner) wrote them and reserved the doll. The doll was packed and awaited the money transfer that came a month later. It was only unpacked again when the current owner got it, so it was not used, played with or customized in any way in that month's period. The owner appeals to Amadiz reps' own words about them admitting their mistakes and wonders how she suddenly became "not a client" and a persona non grata for writing her honest review and choosing to wait with contacting the firm during its vacation period. The owner also wonders about Amadiz Beauty’s idea of ethics and how it allows the company to provide prizes they themselves later call "defective" and "trial products". She also appeals to the Review Contest rules which do not exclude any Amadiz Beauty dolls owners and do not differentiate them. Georg Ramensky replies, repeating the same song about current owner being "not a client", and calling his doll both a play-doll and an artist doll and offering his personal help instead of admitting his company's responsibilities. The owner declines the offer of personal help and demands an official answer from the doll company. She also explicitly forbids Amadiz Beauty reps to mention her and her case even in passing in their personal blog, which they tend to do with all of their clients they have issues with. I will once again repeat my wife's words and mine. You didn't buy this doll with its particular set of options from our company because no one sold it to you. You bought it second-hand from the Dollscar event winner, with the options and doll condition they offered and paid the sum they wanted. Since then two months had passed. Any claims to the warranty had to be lodged in the 14 days period by whoever owned the doll during that time. If the doll parts are broken, our company accepts claims from our direct customers for a long time. The old joint system and feet/hands design, however you dislike them, are not an issue of broken parts and not a warranty case. This engineering design is not and will not be used by our company in any of the ordered dolls. The doll can stand perfectly on its own as you can see in the first unpacking. We recognize as casting defects bubbles on the outer surfaces, lack of resin and unevenly coloured spots. Seam sanding marks and seams themselves are not a defect, the same as with other BJD companies. Therefore, your case is not a warranty case. Since your art doll is unique and is not the same as the current versions sold and sent to our clients (since Yolande mold was never sold on the old type body), you cannot take part in the Review Contest, especially since you're not the company's client. This Contest is for the purpose of getting reviews of our current doll version, received directly from the firm and intended for our immediate clients. Any other Contests for our doll owners will be available to you though. If only you bought the doll directly from us, you could get all the options, revisions, Contests eligibility and whatnot. But that is not your case. - exchange of the old feet, hands and calves for the new parts and colour match them. - smooth out sanding marks so the doll could be enjoyed by you and us fully. - gift you the ballet feet. - send you the official box and doll documents for the current version of the doll. If you want the firm's official answer, you can contact our official mail, as do all of our clients, although you're not our direct client, since you didn't buy anything from us and do not plan to buy anything in the future. The cost of doll parts will be sent to you after 18th of September, when the firm's vacation ends. " TL;DR - Georg Ramensky makes it a point to differentiate himself from his firm, and stating that while the firm won't accept a warranty case, he himself will be ever so kind and actually change the doll parts in question. Is there any sense to that? Not really. The owner appeals to Russian laws of consumer protection which differentiate the periods of lodging warranty claims, returns and the product's lifespan. Amadiz Beauty’s certificate of authenticity only covers the return period duration and says nothing about lodging warranty claims period OR the product's lifespan. According to Russian laws, the warranty claims period for this type of item is 2 years. And since the firm is also the manufacturer of the doll, the product's lifespan is set to 10 years. All this is time for the current product owner, whether they're the second owner or the twenty-second one, during which they have a right to demand fixes or exchange for the like product from the manufacturer. Stating this, the owner refuses any offers of personal help from Georg, and wants the doll parts fixed as the laws oblige. You'd think it could be still resolved here to both sides' satisfaction. But no, Amadiz Beauty won't accept a peaceful solution if it means they have to swallow their baseless pride and apologize. Instead, they make a blogpost about their own interpretation of Russian consumer protection laws, sparking another discussion with the current owners and banning those users who don't agree with them. They also threaten that, if legal action is taken, Georg Ramensky will claim that the Dollscar prize was submitted by him personally as a private artist, which would make the Dollscar organizer (BJDClub owner) as well as the prize winner responsible for the doll provenance and for selling the doll without paying the necessary taxes. So, Amadiz Beauty reps not only ditch their responsibilities, they also want to make innocent people responsible for their mess. And, as a cherry on the top, Georg claims that the current owner is a swindler because she asks for something he doesn’t want to do. Georg, I'm sorry, but you're wrong on many levels here. According to Russian laws, if Georg does make that claim, it would mean that - from legal point of view, he committed a forgery of the Amadiz Company doll, and submitted it as an individual, unlawfully obtaining or forging the doll's COA issued by the company as one of the proofs of manufacture in accordance with Russian government standards. The tailor who previously worked for Amadiz Beauty tells about the working conditions and the materials the Studio owners Georg and Kate Ramensky used for sewing outfits for sale. Amadiz Beauty hired people with no sewing experience and violated Russian employment acts by not employing the workers officially. The sewing process' priority was "We don't care about anything as long as it looks good in the photo". The clash of working ethics was one of the reasons the tailor left the firm, being fed up with having to work only for the sake of photos, with inexplicable deadlines, and with subpar materials. The tailor claims that some lingerie sets were made out of Kate's old sweaty blouse, and the Etsy sold mint skirts were made out of old pillowcases, which were also used for soaking up water when the pipes in the office leaked. The tailor begged Georg and Kate to purchase new and clean materials, only to be fed excuses about keeping deadlines and them being too busy to actually go and buy fabric. "You'll have to make do", the Amadiz reps told the tailor. They did purchase the expensive fabric and materials. But considering that they also brought several bags of fabric from their home, fabric that was covered in cat fur and had a cat smell, what are the chances that the outfit you bought from Amadiz Beauty, a luxury-priced outfit, was actually made out of a new fabric? Not extremely high. The working conditions for sewing were also subpar, because Georg liked to create chaos in the working room, by messing up the stored fabrics and cut patterns, and spilling glue on the work table among other things. This sometimes created plucks in the thin fabrics, to which Georg replied "So what, it's part of the creative process". The main reason the tailor left Amadiz Beauty was that the reps did not respect other people's personal boundaries. Georg Ramensky thinks it's absolutely okay to read other people's private and personal mail, and to comment on the subjects he read without permission. Even now, he continues to stalk the tailor and keeps writing lies that all of the outfits' recent problems are the tailor's fault. TL;DR - Georg Ramensky of Amadiz Beauty WILL read your personal mail without permission, WILL make you a scapegoat, and WILL sew you a luxury-priced outfit out of second-hand fabric. 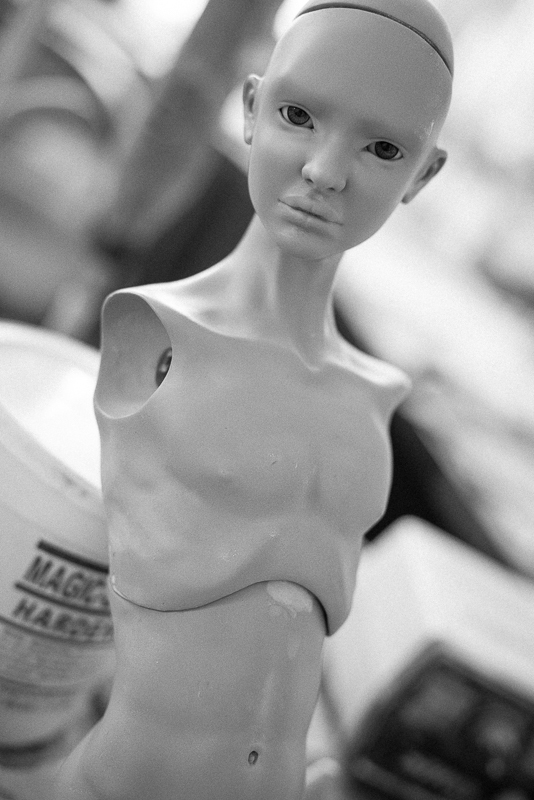 According to their official site, Amadiz Beauty uses Smooth-on's Task resin for their dolls, particularly Task9. While seemingly okay, it's not the smartest choice for a doll maker. First, these resins have great hardness which means greater weight. 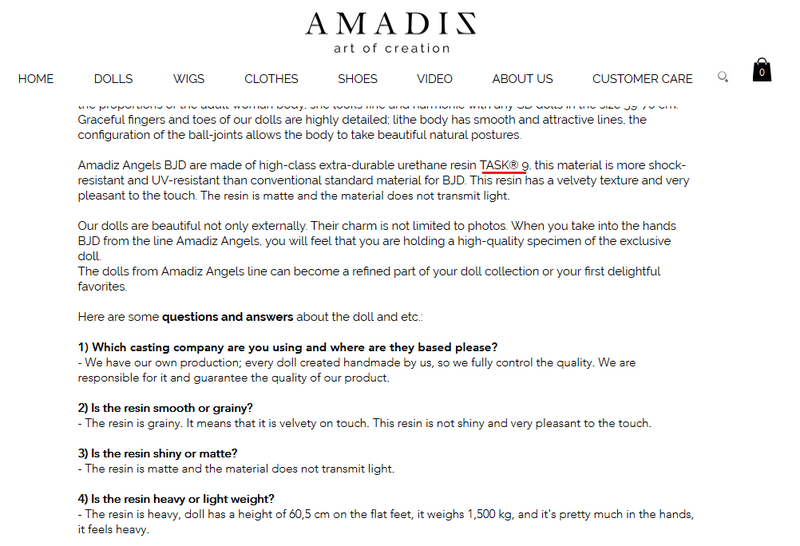 According to Amadiz Beauty's site, their doll weighs 1,5 kg and that means that the resin parts are no more than a couple millimeters thin. It's very risky for big hollow parts such as doll torso, since they would shatter like glass if they ever fall. For the doll to have safe thickness of parts, it has to weigh about twice the stated weight, about 3 kg. Second, most resin dolls, when they fall on a hard surface, get dents or small scratches which could be relatively easy to sand. But Task9 resin would get a big chip or a through-the-thickness crack from the same hard surface contact. Such defects would be impossible to repair. Also, if you try to bend a Task9 detail, it will most probably break. In case of a ball-jointed doll it means that all of its joints are its weak parts and will be prone to chipping. Also, the joints will soon polish themselves to glass smoothness with usage and friction. Dolls made out of Task9 resin will also be difficult to customize. The resin surface is too dense and won't hold the pastels or the sealer well. It might be less reliable than our usual BJD face-ups and blushing. They will also have slight translucency to them, since Task9 is a clear amber resin made to be colourized. During casting, Task9 is a fussy material and may create a lot of bubbles inside the doll part which could make the parts less durable and more difficult to modify. Task9 part may shatter if you try to drill it. With time, things made out of Task9 resin tend to discolour in an ugly fashion and may get sticky. For examples of dolls made from Task9 and what becomes of them, please look up Mooqla. Please note that most doll makers and Russian doll makers in particular have abandoned Task9 as the resin choice and prefer SmoothCast resin. DollsheCraft is one of the examples of SmoothCast resin dolls with their Honey skintones. Amadiz Beauty showcased their very first doll Magdalena in December 2016. The reception was mixed at first, but the doll found some fans and several people considered ordering her, especially after seeing the doll in person at Historical Myth 2017 Moscow BJD event where she was showcased in a Harley Quinn outfit and face-up. Then, the doll in a Harley Quinn outfit and face-up was also present at Dollscar 2017 Moscow event at Amadiz Beauty's stand, and the studio reps Georg and Kate accepted orders for Magdalena doll from those people who didn't get to order her during the pre-order period. Some time later, Amadiz Beauty wrote about changing the size of Magdalena head slightly - but the reps only wrote this in a locked blogpost, unavailable to general readers without subscription to their blog. 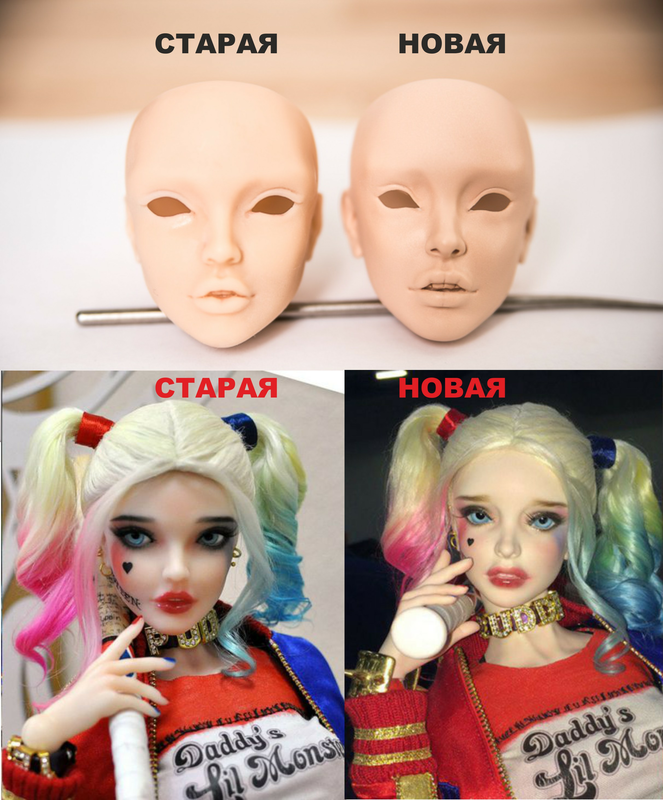 But it soon turned out that "resizing" of the head was "creation of a different mold" instead, and because of Harley Quinn's bright and colourful face-up the clients who ordered the doll at Dollscar event didn't see the difference and thought they were ordering the original Magdalena doll. The clients were greatly surpised to see how different the doll slated for shipping was from the original promo and the Historical Myth one. 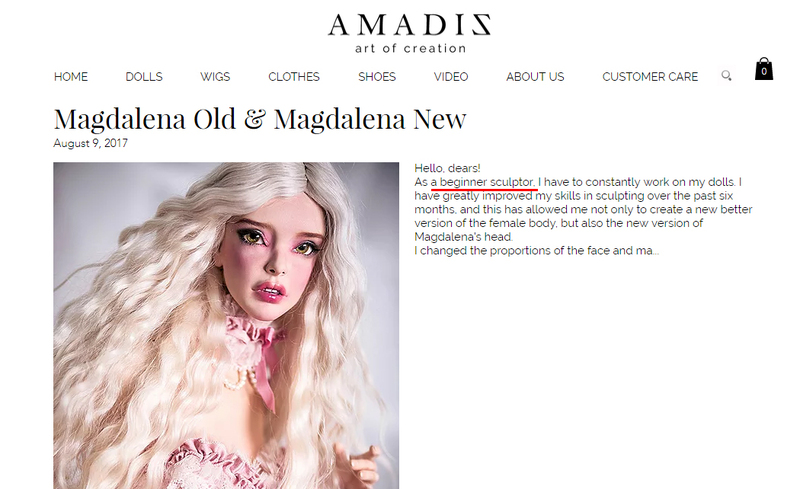 Amadiz Beauty representatives claimed that all the clients saw the Magdalena doll at Dollscar and ordered her knowingly, seeing the mold changes. When the outraged clients objected and insisted on getting the original Magdalena instead of the revised one, Georg Ramensky tried to prove that the clients knew about the change and wanted the new one. After his subscribers kept insisting, he wrote that he contacted all of the Magdalena buyers and offered them a choice between the original Magdalena and the revised one. We saw no indication or discussion on DOA about the Magdalena head change or any deliberations. It's no proof that Amadiz Beauty didn't send out the choice letter, but also not a proof that they did. All the while Georg Ramensky kept insisting that all the clients knew and knowingly chose the revised Magdalena head, sparking suspisions that the original Magdalena doll was not made by him. Seeing how different Magdalena and Virginia are from the later Amadiz Beauty dolls Yolande and Magdalena New there's a lingering suspision of the first two dolls being made by someone else - but when the shipping out time had come, something happened with the original molds which made Georg redo the heads altogether making Magdalena New a completely different sculpt. It is only a suspision and there is no direct proof, but Georg is very reluctant about casting the original Magdalena and keeps promoting the revised Magdalena New head, and also revised Virginia mold to the point of complete irrecognizability. The disturbing part here is that Amadiz Beauty keeps all the revisions in secret and who knows what doll the clients would actually get. TL;DR - Amadiz Beauty present Magdalena at one event cosplaying as Harley Quinn, they present revised Magdalena New in the same cosplay outfit at another event, insisting that the clients who ordered the original Magdalena ordered the Magdalena New one insted. All the revisions and changes were secret. But there are strong cases for suspicions that this information is a fraud, and Georgy Ramensky is not the real author of the dolls. He just bought from other people a ready-made 3D model, in which he makes his own adjustments, presented it as the MM and casted it. Faces seems almost identical, but with some adjustments which are easy to make in program for 3D modeling. These adjustments are so insignificant that could be made even at the 3D-printing stage. As seen above, it's reasonable to suppose that this ready-made model with minor adjustments is Magdalena itself and Georgy Ramensky is not a real doll sculptor. The confirmation of this fact is also the lack of WIP photos of sculpt modeling from Amadiz Beauty. Georgy never wrote about doll production project anywhere and didn't show primary or mid-stages of sculpting but at one moment demonstrated finished result of hard and complex process of doll-making. Georgy Ramensky has no suitable core education and he never worked in sculpting or 3D modeling, but dolls from Amadiz Beauty doesn't seem to be newbie works. Also, there are mistakes in face anatomy, typical for people with lack of basic knowledge about sculpture, who corrects someone else's ready-made base. That fact also confirms the possibility of purchasing of ready-made 3D model. 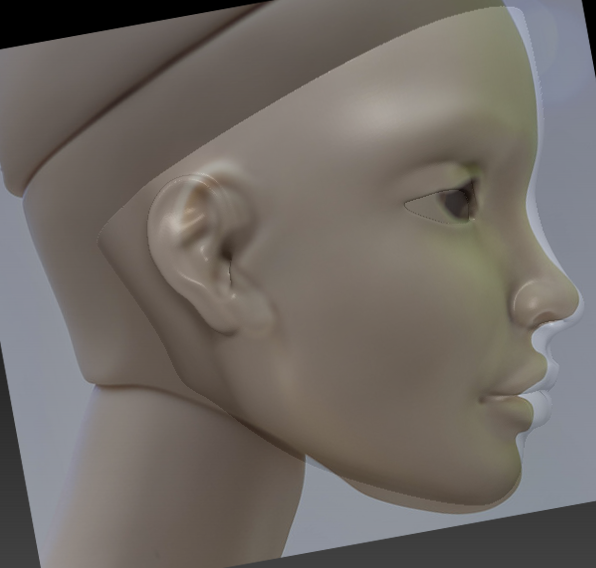 Georg Ramensky of Amadiz Beauty claims to be the sole sculptor of the firm, which is stated on their official site, while, in fact, he bought a pre-made 3D model of a BJD from a different author (3D maker Ivan Plastmaska) and only tweaked it a little. The original model was freely available for purchase for a small sum of 1000 rub (about 17-20 usd). See the link to the 3D model here. The website with ready-made 3D models http://3dtoday.ru has its own public in Russian social network VKontakte: https://vk.com/3dtoday. Georg Ramensky is among members. The other member is Ivan Plastmaska (https://vk.com/i_plastmaska), which has his own 3D-modeling company and is befriended by Georg Ramensky. On the Instagram Ivan also has photos of doll parts closely resembling the Magdalena parts. Georg made some changes to the purchased model which became the first Original Magdalena doll, now marketed as Magdalena Old. He changed the eyes area and made lips fuller. Also, the rear area of the body seems to be enlarged in comparison to the original 3D model. The nose and the ears are the exact same shape as the purchased 3D model, which was confirmed by the original 3D sculptor. After tweaking the 3D model of the doll, Georg presented it as a master model of his entirely new and completely unique doll, and casted it. The adjustments to the original model are so insignificant that they could be made even at the 3D-printing stage. The WIP photos of the Magdalena seem to be faked to appear genuine, with smears of Magic Sculpt on the cast doll. There are no colour photos of the process, also, there never were any other WIP photos, no primary or mid-stages of sculpting with rougher or different shapes that could allow to trace Georg's creative process of the doll making. Georg never wrote about the doll making project anywhere prior to unveiling his almost completed Magdalena doll, and while he doesn't have relevant education or sculpting or 3D modeling experience, the dolls from Amadiz Beauty don't seem to be newbie works. On the other hand they show mistakes in face anatomy typically made by people lacking basic sculpting knowledge when they try to mess with a ready-made base provided by someone else. All the abovementioned facts point strongly to the possibility of Georg Ramensky purchasing a ready-made 3D model and minutely adjusting it to pass as his own creation. This summer there was a giveaway at Amadiz Beauty Instagram with a wig as a prize. One of the workers of the studio (the former tailor) was drafted to assist with the lottery. The worker had to pick one of the paper slips with the name of the winner and show it to the camera. Once the slip was randomly picked, Georg told the manager to "check the winner". And then he said "no, she has ugly dolls, let's redo this". According to the worker, there were at least 20 takes and the randomly picked winners were disqualified by Georg on account of having "ugly dolls", making "ugly photos", not posessing appropriately sized dolls, not having enough subscribers to their Instagram. After a while Georg picked out a "winner" on his own, according to his personal taste. Results of the Giveaway, not so random afterall. На зеленой юбке видно что там где кнопка пришита ткань из шва вылезла у пояса. А еще я вижу что все пояса у юбок кривые. А, вижу, что вылезла ткань. И волнистые пояса тоже. Промо с сайта. Вещь никогда не показывается со всех сторон (в отличие от других магазинов) - это касается и кукол, и сопутствующих товаров. На всех фото очень много фотошопа. Отсутствуют фото кукол без мейков и костюмов. Несмотря на вышеперечисленное, на промо все равно заметно низкое качество товаров. Amadiz тайно заменили голову первого молда до отправки его клиентам: сообщив, что лишь немного уменьшили размер головы, поставили другую, сильно изменённую голову. На выставке Dollscar была выставлена уже не раз показанная всем кукла в косплее Харли Квин (очень яркий мейк) - в него была загримирована первая кукла. На доллскаре ей сменили голову на новую, оставив всё остальное прежним. На выставке была возможность заказать первую куклу всем, кто не успел, и, принимая заказы на первую Магдалену, Amadiz нигде не упомянули, что кукла, стоящая в углу стенда, - другая. На выставке никто не разглядывал, все уже знали, хотят они её купить или нет. Об изменении было упомянуто только в закрытой записи в дневнике - и то, пока читатели не надавили, Amadiz упорно гнули линию, что голова та же, а потом сообщили, что клиенты об изменениях оповещены и не возражают. Клиенты, заказавшие куклу и случайно увидевшие запись, были сильно удивлены, что им собирались отослать другую куклу нежели они заказали. На что они получили ответ, что на доллскаре была эта, и вы покупали её, а не то, что показано на сайте. После был пост, также закрытый в дневнике, про изменение молда - с красивой историей, в которой очень много несостыковок, которые хорошо видны, если вы хоть немного следили за событиями в реальном времени. Но есть доказательства, что вся эта информация - обман, а Георгий Раменский - не автор кукол. Он просто купил у других людей 3D-модель, в которую вносит свои корректировки и отливает. У сайта http://3dtoday.ru, на котором эта модель куклы продавалась, есть официальная группа в крупной российской соц. сети (аналог фейсбука в России) - https://vk.com/3dtoday. Георгий Раменский так же является ее участником. Факт того, что Георгий Раменский не является автором кукол так же подтверждает и то, что он никогда и нигде не писал о своем проекте производства кукол, не показывал начальные или промежуточные этапы, а сразу продемонстрировал готовую сложную функциональную работу. Но у него нет подходящего профильного образования, он никогда сам не занимался лепкой или моделированием. Куклы Амадиз Студио не похожи на первые работы человека, который до этого никогда не занимался созданием кукол. Но зато в анатомии, особенно у лиц, есть ошибки, типичные для людей, не знающих основ, но корректирующие чужую готовую базу. Что так же подтверждает покупку чужой 3Д модели. Еще не утихли страсти по угнанной сессии, как широко известное сообщество БЖД снова доносит попкорна. Без объявления войны, Single Man (он же Amadiz) публикует в своем дневнике пост о том, что он ушел с поста Админа Ликсов. В посте он не только сознается, что "всегда был противником подпакетных интриг и ударов в спину", а так же не уважает анонимность "и никогда этого не скрывал". Амадиз так же признается, что собирал информацию об анонах и модераторах сообщества, скрины, личные данные, писал (псевдо-)анонам в личку(!!!) и многое другое. Сияние плащика ослепляет, весь пост можно тащить на цитаты о том, как НЕ НАДО модерировать анонимки. Сегодня за многочисленные нарушения этики сообщества, использование служебного положения в личных целях, шантаж и попытку давления на модераторский состав, предоставление администраторских прав постороннему лицу, угрозы сообществу (в том числе и судом) и анонимности наших посетителей модераторским составом BjdLeaksBranch было принято единогласное решение о лишении Single Man (он же Amadiz) прав администратора и модератора сообщества. Обращаем ваше внимание на то, что отныне ключи от сообщества и доступ к просмотру IP есть только у двух человек: ЛиксоЕд и Cat:mod. И мы гарантируем, что впредь эта информация не будет нигде и никем использована, кроме самых крайних случаев (таких, как мошенничество, проблемные сделки и нарушения законов РФ или правил дайри), не будет вынесена за пределы сообщества или использована в личных целях. Пост открыт, мы готовы ответить на ваши вопросы, но любые переходы на личности будут по-прежнему удаляться. Что же такого натворил Амадиз? Кто кого покинул на самом деле? И связано ли все это с Хельги, или в БЖД сезон попкорна? Что еще принесет это прекрасное сообщество в этом сезоне? ▼Как Amadiz ведёт расследования / How Amadiz conducts "investigations"
2) Георгин убедился, что Кобзон не Зайков, и стал орать, что Кобзон оскорбил и подставил Зайкова. Емнип, Георг (отец) и был биоматерью. Ммм.. Нет, ебанулись они раньше. См. предыдущую страницу ностальжи. Кстати насчет Феи, - справедливости ради надо отметить, что в итоге Амадизы там все смогли разрулить мирно. В итоге. Ну, по крайней мере, по первому пункту мама стала папой в весьма нежном детском возрасте. Но тут что мужик, что женщина, сабж изначально ебанашка. Очень рекомендую почитать тему, там просто бездны. Там изрядно потёрто. Точно помню поливание Феи говном, мол, она же тоже делает парички, вот и решила попиариться на чужом успехе, так как сама гонит брак и пошлость(с). Ну, сабжи точно орали, что паричок приехал разворошенным и испорченным рукожопой конкуренткой, потом внезапно был пост про то, что они его благополучно продали за полную цену. Про Фею... Ок, если кто не в курсе, то коротко - Амадизы дали свой парик как приз. Парик выиграла девушка, и обнаружила, что приз качества достаточно хренового. Написала об этом на дневе печальный пост. - Мы всегда на стороне покупателя, она должна была обратиться к нам, а не так подло поступать, она плохая. Анон сначала тоже удивился, почему она не обратилась к Амадизам для замены/ремонта... А потом оказалось, что некоторое время назад Фея покупала у Амадизов вещь, которая так же оказалась бракованной. Она обратилась к ним, и ее облили грязью, ничего не исправив. Поэтому в этот раз она не рискнула снова к ним идти, а просто написала грустный пост в дневнике. Анон сейчас ссылки не найдет, может попозже. Анон извиняется за неточность, - в первый раз был не срач с Амадизами, а просто вместо ремонта ей. у меня когда-то была печальная история сотрудничества с Амадизами - тогда исправление парика не подошедшего (слишком маленького) размера свелось к разрезанию шапочки этого самого парика вместо переделки. Еще были какие-то намеки на то, что распаковка приехавшего от Феи парика снята на видео - так и не пояснили, зачем. А про то, чтобы тему пола не педалировать, - так мы бы с радостью, если бы сам товарищ Георг постоянно не тыкал своим полом куда ни попадя. На данный момент Амадизы очень здорово показывают самую свою суть в сраче с Шакалом Табаки (комменты в их дайри к записи про "я ушел с ликсов, я устал и мухожук"). Я просто спросил, анон, что б не испытать разрыв шаблона, когда чел, которого я буду воспринимать как М, внезапно напишет про беременность или болезненные месячные, например. Исключительно вопрос сберегания шаблона. В вк объявы не понесли, молодцы. Это про них же была история, когда заказчик аутфита просил не выкладывать фотки аутфита, пока не реализует свою какую-то идею, а Георг взял и выложил? Анон позырил паблик, но не нашёл ни 1 отзыва. И даже фото от клиентов нет. Это нормально для магазина? тысячи довольных клиентов по всему миру©, о чем ты, анон? Если серьёзно, в том же треде с Феей упоминалось то, что положительные отзывы на ДОА им накручивала их же сотрудница. Да не, анон, я такой оптимист, что готов поверить, что все отзывы были положительные, но где их вообще можно увидеть? У меня от "My inspirition" в их блевнике глаза вытекли - интересно стало, как они ведут дела с зарубежными клиентами на таком вот "лет ми спик фром май харт"? И если такая бохатая и именитая фирма, почему не нанять какого-нибудь переводчика хотя бы, господи, ну позорище ведь. Вспомнил про "бисенона" и теперь опять смеюсь. А у кого днявка амадиза открыта, там что вкусное в комметах есть? Или он вот это вывалил и сидит в тишине, довольный? Была проблема еще с этим костюмом, который покупался за 400$ по старому курсу. Со временем оказалось, что там детали на клею, местами расклеились и было видно желтый клей на белой ткани. И его потом выкупили за пол цены назад. Но сейчас эти посты с разборками и фото удалены. Там очень показательный срач с теми, кто посмел охуеть от всего написанного, и один тупой хомяк. Она всем зареганным открыта. Даже общественным никам. интересно стало, как они ведут дела с зарубежными клиентами на таком вот "лет ми спик фром май харт"? Анон, у половины бжд-тусовки такой английский. Чо уж там, у Сумов, которые вроде из самых крупных забугорных компаний, такой английский, что ваще корейский.